Here at StaxUP Storage, we know our success is due to our wonderful team. The care they give our renters is unparalleled and we want to highlight their milestones along the way. Below is an interview with El Centro and Brawley, CA team member Gaston Gomez, who is celebrating his 1-year anniversary with StaxUP Storage. Gaston Gomez is a member of the StaxUP Storage team in both El Centro and Brawley, California. He enjoys tennis, Chinese food, and spending time with family. 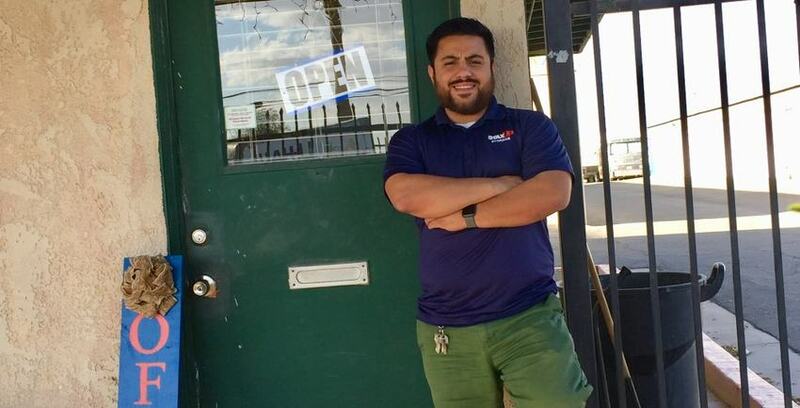 Gaston is an assistant manager at StaxUP Storage in El Centro and Brawley, California. Colby: Hi Gaston, this is actually the first one of these posts that I’ve been a part of and I’m pretty excited about it. First off, how did you start working in self storage to begin with? Gaston: Well it was an opportunity where I had just moved back to the city and I was looking for a job and there was a position available. I applied and got lucky to get hired! Colby: What’s the best thing you’ve learned since you’ve been working here? Was it what you were expecting? Gaston: Yeah it was more than I was expecting. It’s been a great company to work for so far. Something I have learned is that I’ve become more patient with customers. I’ve always worked in retail and always dealt with customers but for some reason here, I’ve become more patient and learned to deal with different situations better than I used to. Colby: That’s great! What are some hobbies you enjoy doing when you’re not at work? Gaston: I like to spend time with my family. We usually go out to the park and go for walks. For me, I like to go play tennis with my brother. That’s one of my favorite hobbies. Colby: Nice! Between the walks with the family and tennis with your brother, is that your favorite thing to do when you’re in El Centro? Gaston: Yes, those are my favorites. Colby: What’s the best place, the best restaurant in El Centro? I’ve never been. If I were to take a trip down there, where should I go before I leave town? Gaston: Well, my favorite food is Chinese so my favorite restaurant is Lucky. If I want to eat better food, it’s better across the border in Mexicali. Colby: Would you like to give a shout out to anybody? Gaston: Just a shout out to all my co-workers at Imperial Valley. Most of them have helped me be successful in the company have taught me a lot of things. So really everybody in Imperial Valley. Colby: Well, thank you, Gaston. Hopefully, we’ll have this conversation with you same time next year!